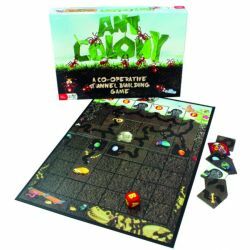 Ant Colony is loads of cooperative fun. Players must overcome obstacles as they work together to build an ant colony. Just watch out for hidden rocks, angry beetles, and pesky anteaters! 2-6 Players. Ages 5 and up.